It is always an emotional subject for anyone to be back to the roots. And it becomes even more touching when it happens after a long time. 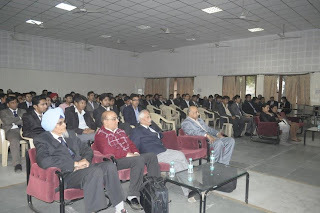 DoMS, IIT Roorkee also witnessed it on 24th and 25th November 2012. The occasion was silver jubilee alumni meet, a chance for former students and now industry stalwarts to return to Roorkee after a gap of 25 years. The alumni as well as the institute both were equally jubilant for the moment. Not only these two days gave us a chance to meet them but it also provided an opportunity to listen and learn from these experts. A total of eight eminent personalities gave their views, opinions and thoughts on the topic “Shaping the Future” which has now achieved relevance as never before. The event went on for two days and proved immensely helpful for students to get an insight and understanding of real world business. Mr. Arvind Mohan Mathur (AM): Mr. Arvind got his engineering degree from IIT Roorkee in 1987. He then joined IIT Delhi and completed his masters in 1990. He earned his doctorate from Michigan State University in 1996. He also holds an MBA degree from New York University - Leonard N. Stern School of Business. He has over 12 yrs of experience in the Pharmaceutical Industry in business management, market access, consulting, strategy and marketing & sales capacities. Currently he is the Head, Hospital/Specialty Business at Novartis. Mr. Gaurav Saxena (GS): Mr. Gaurav is also passed out from IIT Roorkee in 1987 with a degree in chemical engineering. He has around 25 years of industry experience and currently serving as an AVP at Reliance Industries Limited. 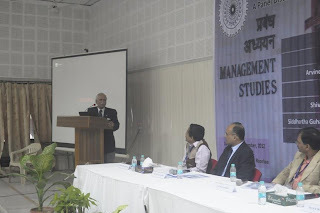 Mr. Siddhartha Guharay (SG): Mr. Siddhartha obtained his chemical engineering degree from IIT Roorkee in 1987. He then joined the University of Missouri-Rolla and completed his masters in 1991. He is having more than 30 years of industry exposure. Currently he is working as Chief Engineer-Process at MottMacDonald Pvt Ltd.
Mr. Mayank Sharma (MS): Mr. Mayank completed his graduation in electronics and communication engineering from IIT Roorkee in1987. He has over 9 years of working experience. Currently he is the VP and Head - Africa Market Unit at Comviva. Q: How do you see IIT Roorkee ten years down the line? SG: Always draw your lesson from the past. Adapt according to the outside world. Visualization of the future plan is very important. AM: Future is uncertain and it is difficult to see it. However trend is visible for us to see. IIT Roorkee has definitely grown on its reputation. To shape the future, we must have to shape ourselves first. We should also prepare for the change. One should need to focus on learning new things. Based on that capability, future can be shaped. Another key aspect is innovation and this is where we should concentrate and contribute. GS: Study of the engineering sciences gives us certain tools. But this does not alone guarantee success. One important characteristic is the spirituality quotient. Mr. Gaurav mentioned the Deepak Chopra’s book “The Seven Spiritual Laws of Success”. MS: One must keep the passion for excellence. If the passion is not present, future can’t be held. The example of the Ganga Canal was cited by Mr. Mayank to show how this passion resulted in an engineering marvel. Q: What is your idea about entrepreneurship and how one should approach for starting a new business? AM: Being entrepreneur is the coolest thing. One does not need to get permissions from others to do anything. But entrepreneurship also carries a certain amount of risk and this should not be avoided. Therefore the here comes the Passion, the first ‘P’ of entrepreneurship. Without passion, one can’t get success in anything. One must also focus on the initial five to ten years of the business as they are the most challenging ones. MS: For every success story, there are hundreds of untold failures. We should still remember the success. Every failure brings more possibility for success. Failure as popularly believed, may not be dramatic. We should be ready for failure and recover from it. Entrepreneurship is deemed to be working independently which on the other hand, is actually working according to many stakeholders like consumers, partners, employee etc. SG: In an entrepreneurial venture, trust between partners is extremely important factor. Hence the selection of the partner is very important in entrepreneurship. The example of Dhirubai Ambani was quoted to suggest that we should not get too upset by failures. At the end it is the belief which works. Additionally, attitude is a vital factor. Knowledge can be gathered, skills can be developed but attitude one carries with oneself. And that decides the success or failure. Lastly, there is need of the value based education system. GS: the primary purpose of entrepreneurship is “how to serve better than others”. This is the theme of any business. One should learn about the need, explicit and implicit and act accordingly. The panel discussion was concluded with this note and now it was the time for questions from the audience. Q: How conducive is environment for entrepreneurship when compared to 25 years ago? MS: It is certainly much better. There was no concept of venture capital then. Now a days funding is very easy and environment is positive. One should note that first group most often comes from a near circle such as family, friends etc. Even the big business enterprise capital is actually small funding from some very rich people. The share is low as it carries great risk. Q: Please tell us about your journey. AM: After my graduation, I worked for BPCL at Bombay for one year. Then I joined IIT Delhi to pursue my master degree. After my masters, I went on to join Michigan State University for my PhD. I have also got two patents in my name. I also for around 7-8 papers published including one of them in the “Nature”. Later I completed my MBA from New Jersey. One should plan according to the goal. The sooner you know what you want to do, the better focused you are. SG: After graduation, I worked in Haldia Petrochemicals Limited which has government has stakeholder as well. Generally government organizations are viewed with certain denigration. One should not overlook the status and contribution of PSUs. These PSUs have actually built our nation. There is no dearth of talent either. The fault lies somewhere else. Another point was, an engineer should acquire the hand-on experience. This is required in case of better management even. These were the questions in front of the guests which were aptly responded. Then a note of thanks was delivered to all our esteemed guests and it marked the end of the day. It was truly an enriching experience for all of us and we were eagerly waiting for the next day. The second day was even more rewarding to us. 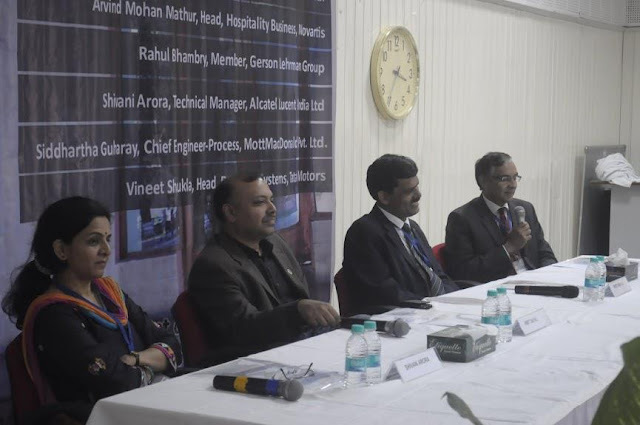 Apart from the panel discussion, we also got to listen to two other eminent personalities from industry, Mr. P. Balaji and Mr. Parag Gupta. They spent some valuable time with us and shared their views on a range of topics. 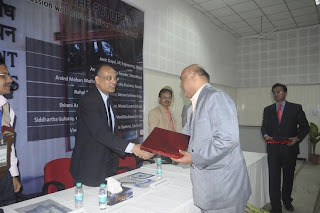 Mr. P. Balaji, VP & MD, Nokia India is an IIT Roorkee alumnus. He got his engineering degree from IIT Roorkee in electronics followed by post graduation in management from IIM Ahmedabad. He has over two decades of experience in IT and Telecom industry working with organizations like Sony, Ericsson, Lucent, AT&T and Tata group. Another great speaker is Mr. Parag Gupta, MD, Vopak India. He also earned his degree in mechanical engineering from IIT Roorkee and did his MBA from IIM Ahmedabad. Mr. Parag also has about twenty years of experience in sales, marketing, business development and general management. These alumni talked about how to gear ourselves for the future, what skill sets one needs to have particularly in entrepreneurial context, a brief yet insightful idea about current industry and also gave valuable advice to students. Mr. Anupam Singh (AS): Mr. Anupam got his engineering degree from IIT Roorkee in computer science in 1987. He completed his masters from PHTO Utrecht, Netherlands in 1991 and also holds an MBA degree from IIT Delhi in 2000. He has more than 20 years of experience in building engineering teams from scratch, leading start-ups as well as large product teams. He is the Co-founder at SharedReach. Mr. Amit Dayal (AD): Mr. Amit completed his graduation in computer science from IIT Roorkee in 1987. He then joined the University of California and completed his masters in 1989. 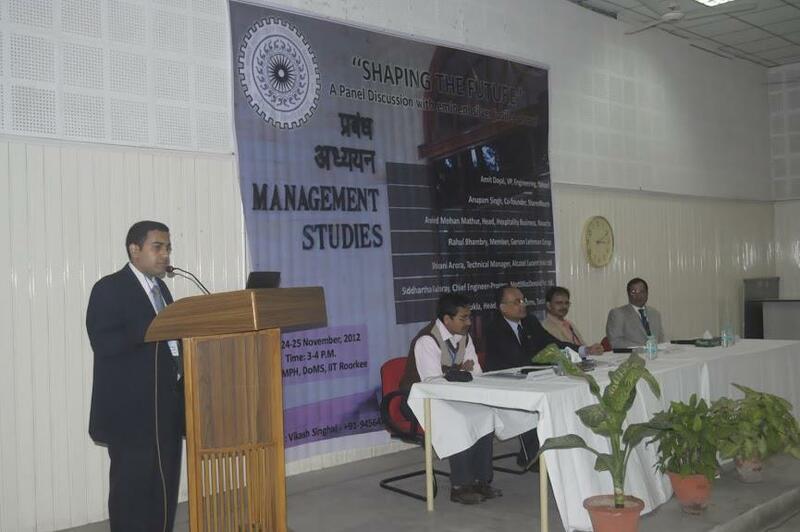 He has also done MBA from University of California in 2000. He is having more than 20 years of experience and currently working as Vice President Engineering, Yahoo. Mrs. Shivani Arora (SA): Mrs. Shivani did his graduation in computer science & technology from IIT Roorkee in 1987. She completed his master from IIT Delhi in 1989. She is also an accomplished badminton player. She has over 20 years of experience and is currently working as technical manager at Alcatel Lucent India Ltd.
Mr. Vineet Shukla (VS): Mr. Vineet got his engineering degree in industrial engineering from IIT Roorkee in 1987. He completed his masters from IIT Delhi in 1988. He is having more than 25 years of experience and is currently working as a Program Manager at Tata Technologies Ltd. In addition to these distinguished speakers the occasion was also graced by other alumni. We had Mr. Alok Mahajan from KPMG, Mr. Sanjay Saxena from HDFC Ergo, Mr. Pradeep Ahluwalia from State Street Corp, Mr. Ravindra Gupta from Man Diesel, Mr. Bhupinder Singh, Mr. G. Srinivas from NPCIL, Mr. Sanjay Keshwani from Dassault System, Mr. Deepak Chawla from ZenPrise, Mr. Deepinder Setia from CONTRAIL System, Mr. Amitabh Diwakar an architect and Mr. Arun Agarwal from Shell. These experts also shared his views with the audiences. As again, the profiles of the guests were very extraordinary. The event started with welcoming the alumni by Dr. Rangnekar, our head of department. Then these guests were introduced to our department through a presentation. Afterwards the panel discussion began. Q: How do we shape the future? AS: Future is actually in our hands. My belief is, the way you can shape the future is by acquiring the entrepreneurial spirit. Passion is a very important factor for the success. Another factor is persistence which is also essential for success. The next factor is ownership. One should remember that ownership is never assigned, it is always acquired. SA: Basics of communication are very important. Another thing is that we desperately lack planning. We might be good in execution but we must focus on planning part. VS: We are deciders of our own futures. Vision is really a big thing for shaping the future. Also consistent teamwork is the key for the success. Conviction is significant for success as well. Lastly, knowledge is something which can be acquired but wisdom can’t be. AD: Technology is the new mantra. Whatever you do, technology will be a part of it. Therefore we should embrace, not go away from technology advantage. Future of technology is around products, not the services. So we have a mindset that we have to build great products. It was a fruitful dialogue and next was the specific queries round. Q: With respect to IIT Roorkee, how do we go about i.e., what is the road ahead? SA: IIT Roorkee has lots more potential than it has today. The major area of focus is planning. People in other countries put a lot of efforts in planning which is not happening in India. Also, a lot of people want to do things for IIT Roorkee but they have time constraints. IIT Roorkee should produce a game plan to go about how to get best results from people who do not have enough time but have the will to contribute. Q: Apart from passion and persistence, how important is the idea? AS: Ideas are necessary but converting them into tangible thing is the key. It is therefore more important to spend time thinking. Ideas can’t be generated by sitting at home. Expose yourself to the outside world and learn what is going on around the world. AD: before any idea, we have to check whether it is required at all. The reason being, if it is not satisfying any need it is not fruitful. 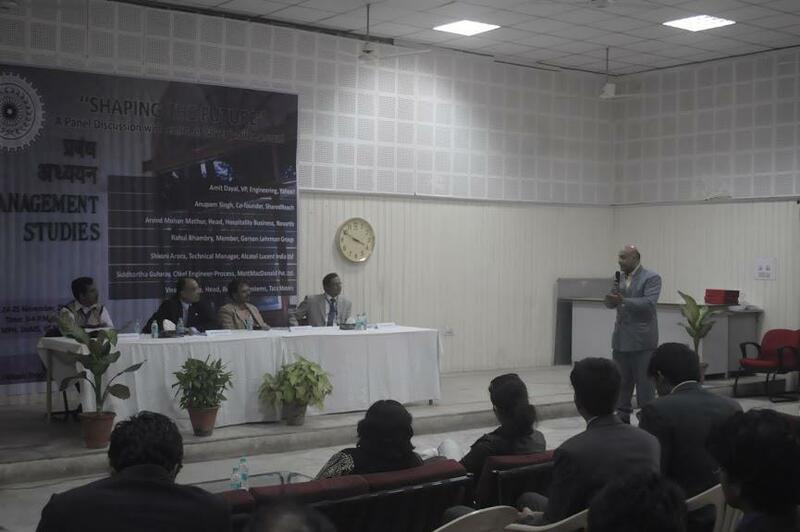 Q: Talking in the context of Indian IT industry, we see a lack of innovation. How we as managers, can mitigate this issue? AD: Usually a lot of focus is given on services rather than products. However products are the area where there is a lot of scope of innovation. Services generally have optimization rather than true innovation. This has been recognized and there is increased focus on innovation. Now most of the service organizations also operate in product domain. VS: Today the market is changing which is giving a lot of push for the product development. In the future, we expect to see innovative ideas from this section mainly. AS: Prima facie, product development provides a comparatively low return on investment to the service provider. People should understand what product development is. Building or creating a product is the easy part. The tough part is to sell it and manage it over the time. But that is where revenues are generated. In comparison, the service industry is a lot easier. However product development is very learning and it adds tremendous value to the person. Organizations always look for a person with significant product development exposure. Q: What are the must-haves for starting up an entrepreneurial spirit? AD: the first thing we should look for is, are you solving a problem or it is just for the sake of it. The next important consideration is, do you have the right team. AS: Finding the right team is like marriage. We need to spend time with a person to evaluate if we can trust the person. It is extremely important. Second, it is not about the idea but the passion about the idea. SA: One must be ready for the failures. Once we know we can handle it, we can focus on it in a much better way. VS: Learn to be risk taking. Discipline is very important yet we should also have enough flexibility to take up new challenges. Discipline should not be translated into rigidness. This was the last query and it marked the end of the session. A note of thank was delivered to all guests. This marked the formal conclusion of the session. Overall, it proved to be a very useful session which would definitely help students in their grooming as future managers and leaders.